My little guy is very much into Marvel super heroes lately. He has a gazillion Marvel action figures and Legos; he has started playing the Lego Marvel Superheroes video game with his brother; and at bedtime he almost always chooses a book featuring Iron Man, Spiderman or the Avengers. When he went to they fabric store with me a few weeks back he picked out this Avengers fabric, so I decided to make him some pajamas with it. 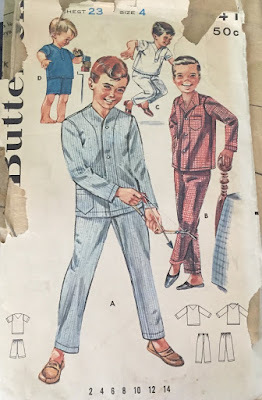 I used a vintage sewing pattern for the pajama pants. The pattern has only one piece for each leg which worked well for this fabric since it is a pretty large scale pattern; it allows the images to be unbroken by a side seam. I modified the pattern slightly by making the legs straight instead of tapered. For the t-shirt I used the raw-edged raglan pattern from Sewing for Boys (affiliate link). This is my go-to t-shirt pattern for the kids, although I rarely do the raw-edged thing. It is super quick to sew up on my serger and, for pajamas, I can just leave the sleeves and bottom un-hemmed. In this case, I was up-cycling an old shirt of mine for the sleeve fabric, so I re-used the hems. I appliqued a few leftover panels from the Avengers fabric on to the front of the shirt with a zig-zag stitch and - as my little guy would say - "Wall-la!" a comfy matching set of PJs. And now, I think someone wants to read a story. I really like the addition of the panels that you added to the shirt, was a awesome idea I'll keep stored in my back pocket!